A friend asked me to go with her. We were going to start a program to train for a half-marathon. What? Me? A runner? No way. I was overweight, eating poorly, and not exercising at all. The program started slowly, encouraging us to walk and run until we built up our endurance and our pace. Our training schedule told us when and how far to run. I followed it religiously. Sure enough, I started to run longer distances each week. Three miles, four miles, five miles. As I continued running, I gained more confidence, and I started to lose weight. I found that time spent running was peaceful, uninterrupted time – something we moms seldom have. Without consciously realizing it, I became a runner. And running changed my life. If you’ve ever thought about being a runner (or if you are looking for a great physical activity that provides an outstanding calorie burn) look for a running group or coach in your area. Any time you take up a new hobby, you start to acquire the gear that accompanies that hobby. Over the past 6 months, I’ve developed two systems that help me keep track of all of my running gear. 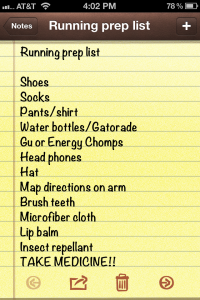 My Running Prep List: I keep this list on my iPhone. It includes everything I want to remember before I go running. As I have evolved as a runner, I’ve added things to the list and I’ve taken some things off. Admittedly, pants and shirt probably don’t need to be on the list! But hey, I’m comprehensive – and I use it as a checklist when I’m laying out things the night before going running. 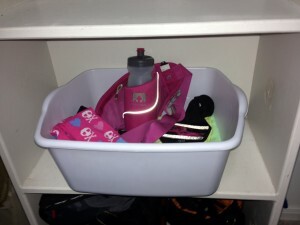 My Running Bucket: The longer I ran, the more running gear I acquired and enjoyed using. At first, I just showed up with my water bottle, but now I have and want to use more running stuff. Thus, the need for my running bucket. This is just a $3 dishpan bucket from Wal-mart. I keep my “things I need for a run” in this bucket. You can see my iPhone armband holder with my earbuds tucked inside, my Nathan Triangle Water Belt , some Gu’s and Sports Beans , arm sleeves (in case it is colder here in Texas), ear covers, a Bondi Band , etc. It sits nicely on the shelf in my closet. 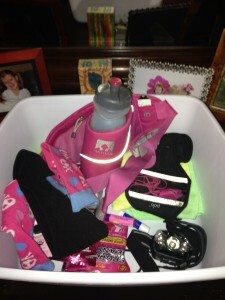 And, when I go running, I pick up the whole bucket and put it on the front seat of my car. This proves especially helpful when I misjudge the temps as I did recently, and I ended up really needing the arm sleeves (purchased from the tween section at Michael’s. Be in awe of my coolness!). I’ve been blessed with a Rubenesque figure, and us full-figured gals need athletic bras that are more supportive than the average sports bra. 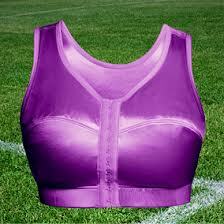 I’m able to be a runner today because I discovered Enell Sports Bras . The support they provide is unmatched, and they give me a “no bounce” factor when I’m running or working out. At $64, they are a little pricey, but they last forever. In my collection of Enell bras, I have two that I’ve had for over seven years. They are still just as supportive as they were when I first got them.